What can be expected with a Mystery’ghan? Well, this is the Fifth year I have designed a Mystery Afghan. I release the pattern a little bit at a time, over a period of 6 – 8 weeks, in a series of “Clues.” The clues are carefully written to preclude the use of photos. You will feel a sense of accomplishment as you complete the clue without any idea of what it is supposed to look like! It is great fun if you enjoy mysteries! If you can’t wait, photos show up within a day or so! I am going to have dedicated threads on my Ravelry board for “spoiler photos” and for “no spoilers.” After the clues are released, I can’t control that spoiler photos won’t appear, especially since we are on Facebook and other social media outlets now, so if you do not want to be spoiled, you have to be careful just to download your clue and avoid Ravelry and Facebook until you are done! I will post tutorial photos for tricky parts (if any) and you can always ask for help and you will always find an answer with all the helpful people in my group. Mystery Afghan 2015 – Get your yarn ready! Now is a good time to prepare for our MysteryGhan as we still have ample time to stock up on the yarn needed. I am very grateful and excited to have my design vision supported by a major yarn company, Scheepjeswol. 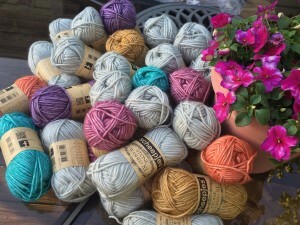 Not only do they produce gorgeous yarn, but they are very supportive of independent designers. They’ve made arrangements for two sizes of custom yarn packs with the recommended Scheepjeswol Stone Washed XL to be available at Deramores.com now. This is a yarn super-store website based in the UK with an established track record of selling a fabulous array of yarn brands to the US and all over the world . I have ordered from them many times and I’ve received my order in New York within 7 to 10 days. The large size pack contains the yarn to make a 48″ x 72″ (122 cm x 182 cm) afghan. The medium size contains the yarn to make a 48″ x 48″ (122 cm x 122 cm) afghan. If you order from Deramores using these links – large pack, medium pack, I will receive a commission on the purchase. Thanks! Download the mini-clue using the directions in the post below for more information. Clues will begin on August 1! For the fifth year, I am happy, proud, and excited to present the JulieAnny’s Mystery Afghan crochet-along. Thank you to all who purchase my patterns throughout the year and welcome to all who are new to my work. This afghan is called Summer Mosaic and was inspired by the bright and hot summer sun shining down on colorful mosaic stepping stones. Construction is mostly easy, with some post stitches and popcorn stitches, but very doable for an advanced beginner crocheter. The afghan will be a 48″ x 72″ (122 cm x 182 cm) rectangle, but there will be an option to make a smaller throw at 48″ x 48″ (122 cm x 122 cm.) Yarn packs in the suggested yarn Scheepjeswol Stone Washed XL are available for purchase at www.deramores.com now – here are some links – UK large pack or UK medium pack. There is free shipping and no sales tax to the US – US Large Pack and US Medium Pack . For other countries there is a pull-down menu on the website. Stone Washed is a dream to work with! Please give me a LIKE on my Facebook page, and follow the chat about this pattern at my Ravelry board. 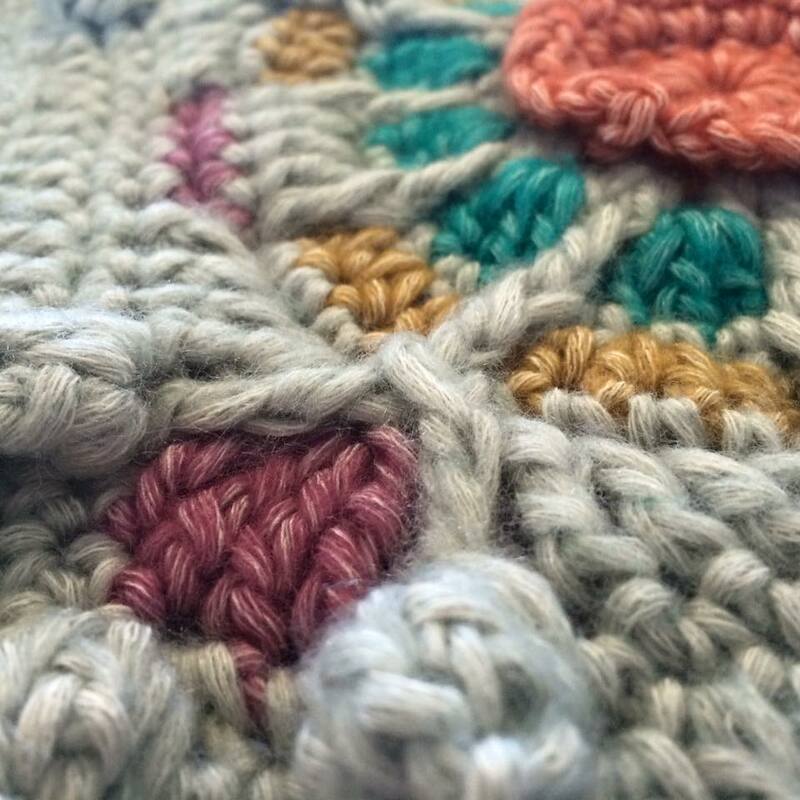 Mystery Afghan 2015 – Summer Mosaic – Coming Soon! I’m working out the final pattern details on this year’s Mystery Afghan. As I stitch I am thinking of the best way to present the clues. Final result will be a rectangular afghan measuring about 48″ x 70″ in aran weight yarn, but getting to that size will be the fun part! I like to keep you all guessing! I will give more details on yarn requirements and obtaining the clues as things become more clear. I’m working on getting yarn packs made available. Pattern will be FREE for the duration of the CAL, about two months, and then when complete will be a paid pattern. The clues will be released weekly on Ravelry.com. Watch for details here on my blog, julieyeagerdesigns.com, my Facebook Page – Julie Yeager Crochet and Knit Designs, and on my Ravelry board.